Tickets are now on sale in York at Books for Amnesty (42 Goodramgate) and Cycle Heaven (2 Bishopthorpe Road) priced £4. They are online at www.wegottickets.com/yorkamnesty with a 40p booking charge. The mathematician Alan Turing, generally recognised as the founder of computer science and the leading scientific figure of Second World War codebreaking, was prosecuted in 1952 under the law which in those days made all homosexual activity illegal. His trial and punishment, and his death in 1954, have in recent years acquired the status of a historic human rights story. 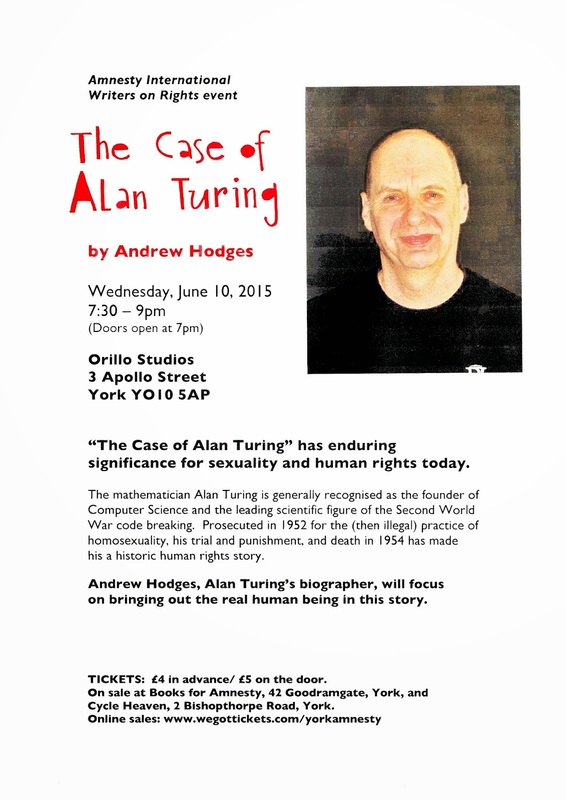 As Alan Turing's biographer, Andrew Hodges will focus on bringing out the real human being behind this story, with his very special friends, relationships, words and deeds.